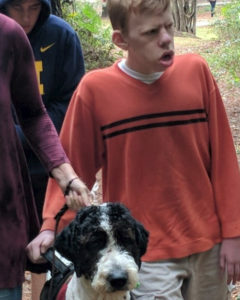 It was recommended that Nathaniel’s family try to acquire a Service Dog for him that would not only help him with calming pressure point skills and retrieving items that Nathaniel needs during the course of the day that he cannot pick up on his own. More important than that is Mobility. With his condition of Myotonic Muscular Dystrophy Nathaniel’s muscle tone in his legs are decreasing rapidly. This causes him to fall when he tries to stand or walk. The outcome has been numerous injuries to Nathaniel due to falls. Nathaniel’s parents contacted us, Paws for Life at Animals Deserve Better, and arranged for a Service Dog for Nathaniel. They call the dog “Dug” as being Nathaniel is non-verbal this is the closest sound, he can make that sounds like dog. Dug has been wonderful for Nathaniel. He is able to live a better quality of life as Dug allows for mobility assistance as that is one of the areas he is trained for. As you can see in the picture above the family is out for a walk and Nathaniel is braced by holding on to Dug. Unfortunately, while Dug was helping Nathaniel, Dug’s left rear knee was hurt requiring surgery. Thankfully after all medical treatments and therapy is completed for Dug he will continue to care for Nathaniel as if nothing happened to him. Nathaniel’s parents can not afford all of this. It is hard on a family to have a child with this type of condition and the expenses that go with it. The medical costs for Dug and the life long training for Dug come to $16,000.00. 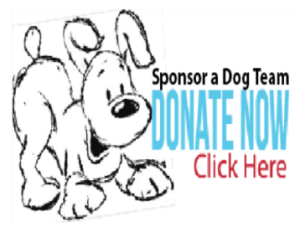 Please consider making a donation to help with the training and medical expense for Dug, no donation is too small and every donation is appreciated more than you know. Click here for their gofundmepage.